Georgia grew up in Vancouver with three older brothers. She chased them around and simply had to keep up if she wanted to hang with her bros. This led to her adrenalin seeking behavior where she quickly worked up the ranks to the National Alpine Ski Team. Georgia competed in her hometown Winter Olympic games in 2010 in the Super G event in Whistler, Canada. She decided to switch sports after the Games to the sport of Ski Cross. Her talent and work ethic earned her on to the Ski Cross National team within months, and later to the 2014 Winter Olympic Games in Sochi, Russia in Ski Cross. Georgia wanted more. 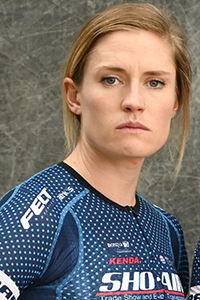 She wanted to be a summer Olympian so in the spring of 2015 she decided to put Ski Cross on hold and commit everything to make the Canadian Track Cycling National Team. Georgia, just having competed in 2 international competitions with Track, was named to the 2016 Summer Olympic Games with the Canadian Team pursuit team and brought back a bronze medal to Canada. She is back focusing on cycling looking towards Tokyo 2020. Georgia is thrilled to be apart of Twenty20 on the road. I always loved to bike as cross training as skier. Something in 2014 sparked my interest and an idea of becoming a summer Olympian got stuck in my head and it just never went away, so I decided to try and make it a reality. I am lucky to have so many incredible people in my life, many of which are incredibly successful athletes who are also incredible people. These people inspire me daily. I think this sport is by far the most rewarding I’ve done. There is nothing like doing a workout, giving every ounce of your energy to it, and doing the exact same workout the following week and visibly seeing yourself get stronger. I love that. Crossing the finish line in the 2016 Summer Olympic Games to win Bronze with my Canadian teammates. Hmm.. I haven’t been to many places, but London was very cool. Yoga is a big part of my life. I enjoy getting into a grove when I’m in one place for a while and going to a class almost every day. You’re capable of so much more than you think. Push your limits both mentally and physically, but listen to your body. Understand that rest is as important as training itself. Drink coffee, and Stretch. I’m only half kidding about the coffee. Eating well and proper nutrition is a huge key to my success. Probably an athlete in another sport. 1.My top songs are constantly changing! But anything up beat with a great beat. Anything fresh, with tons of veg and a great dressing. When I go home to my parents for dinner after a long trip my mom and I often cook roasted chicken, quinoa, roasted cauliflower and sautéed swiss chard.